← Do Concussions Accelerate Aging of the Brain ? What are the components of balance according to Guskiewicz and friends? Think of balance at the center of postural control employing the resources of the brain to handle the information using special sensory receptors to surrounding environmental and physiological conditions that affect a persons ability and capacity to maintain equilibrium. Balance is at the epicenter of a clock-face integrating at noon the musculoskeletal system at 2 sensory organization at 4 motor coordination at 6 environmental adaptation at 8 predictive central set and at 10 perception of orientation. At the heart of the CTSIB is the rationale for baseline screening for the following reasons on a static surface as an accepted protocol for balance assessment. 1. The breadth of the existing studies supporting and accepting the CTSIB as avalid clinical assessment of balance. 2. Well documented definitive correlations for mild traumatic brain injury. 3. The comprehensiveness of the test to address each of the systems thta contributes to balance: Visual, vestibular and somatosensory. 4. Ease and efficiency of doing the test and high inter and intra rater reliability. 5. Clinical familiarity with the test. The modified clinical test of sensory interaction and balance consists of four conditions. This test provides a generalized assessment of how well a person can integrate various senses with respect to balance and compensate when one or more of those senses are compromised (after a concussion). Postural stability is measured by recording postural sway. 1) Reference (both eyes open standing on a firm surface) information is available by all 3 sensory inputs: somatosensory, visual and vestibular. 2) Both eyes closed, firm surface -visual not available, somatosensory and vestibular are available and accurate. They are dependent on somatosensory and vestibular systems. If the person performs poorly here, there is something going on with one or both of these systems as this particular person has become visually in my words delinked/demeshed. 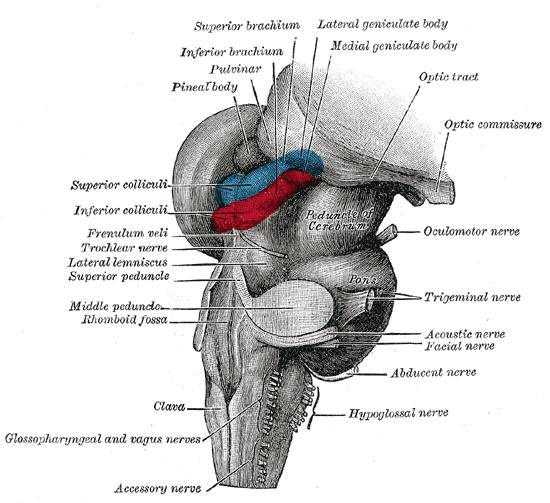 This is the critical brain information integration that the GyroStim vestibular stimulation appears to address. 3) Both eyes open, unstable surface (foam) – somatosensory is available but inaccurate, visual and vestibular are available and accurate. Suppose the person does poorly, the condition takes away somatosensory and leaves vision with vestibular. performing worse means they were dependent on the somatosensory system. Somatosensory input consists of proprioception and touch. This signal input allows the muscles that control posture to make constant adjustments to maintain balance and avoid falls. This may or may not be perturbed following multiple concussions depending on the severity and subsequent healing progress after each concussion incident. There is also the distinct possibility that concussion self reporting is underestimated in-advertantly or deliberately. 4) Both eyes closed, unstable surface- This is likely where concussed persons will show some problems. Both the visual and the somatosensory systems have been taken away from the input scenario, leaving the vestibular control apparatus in predominance. If the person does worse than their baseline, they have something going on with their vestibular system integration. The vestibular system is responsible for processing information about movement with respect to the gravity vector input; more specifically rotation, acceleration/deceleration and head stabilization during exertion. The vestibular system works in conjunction with the visual system to stabilize the eyes and maintain posture during exertion. Vestibular disorders cause a feeling of dizziness and unsteadiness. The vestibular system has been compromised due to the concussion. So what is measured during the CTSIB test procedure? It’s called the Sway Index. Thde Sway Index is an objective quantification of what is commonly done with a time-based pass/fail for completing the CTSIB staqge in 30 seconds without falling. An observer can assign a value of 1 to 4 to characterize the sway. For instance, 1 = minimal sway, 4 = a fall. According to Guskiewicz, the Sway Index is really the Standard deviation of the person’s average position from center. The higher the Sway Index, the more unsteady the person was during the CTSIB test 4. In other words, they had trouble trying to balance themselves, eyes closed on a random surface. One balance platform company, Biodex, using a pressure balance platform computes a visual Concussion Summary report which overlays and compares an individuals CTSIB tests with a baseline comparison to any CTSIB test following a concussion. So how to understand what is happening during sensory organization for balance? The sensory system includes the eyes, ears, vestibular apparatus (the inner ear), the somatosensory system which is touch and proprioception, taste and smell. The parts of the sensory system that contribute directly to balance are the visual, vestibular and somatosensory touch and proprioception systems, essentially subtracting taste and smell input. This sensory system receives input from the environment through specialized receptors located in the sensory end-organs in the eyes, vestibular apparatus of the inner ear, muscle spindles, Golgi tendon organs, and touch receptors in the skin. Sensory input is transmitted to the spinal cord via the afferent nerve fibers and then to the brain via spinal nerve tracts. The tendon organ is a stretch receptor that signals the force developed by the muscle. Seems to me we keep coming back to that shape thing, the tensegrity of detecting stretch, which is monitoring a shape change. The Ib sensory feedback generates spinal reflexes and supraspinal responses which control muscle contraction. Ib afferents synapses with interneurons within the spinal cord that also project to the brain cerebellum and cerebral cortex. One of the main spinal reflexes associated with Ib afferent activity is the autogenic inhibition reflex, which helps regulate the force of muscle contractions. Tendon organs signal muscle force through the entire physiological range, not only at high strain. Why is vision such a critical part of the balance system? Vision allows us to identify and tract objects as our eye muscles pivot and swivel. Vision orients us by tells us where we are in relation to other objects. When we use vision to gather information about the position of our body according to our immediate surroundings or to determine the position of one body part vis a vis another, then vision is providing visual proprioceptive information to the central nervous system. Vision works in conjunction with the vestibular system comparing information about velocity and rotation from the vestibular system with actual visual information. The visual system is a combination of both central and peripheral vision. The vestibular system is responsible for processing information about movement with respect to the ever present gravity force vector. This orientation is specifically concerned with rotation, acceleration/deceleration coordinating head stabilization including balancing and smoothing neck muscles during gait. The vestibular system works in conjunction with the visual system to stabilize the eyes and maintain posture during walking (vestibulo-ocular reflex). Vestibular disorders cause a feeling of dizziness and unsteadiness. Vestibular disorders also affect the ability of the CNS to mediate intersensory conflicts, for example when near by objects move giving the incorrect sense of motion. Concussed persons may exhibit eye twitching/nystagmus. Lehmann reported in 1990 in Arch Physical Med Nov that traumatic brain injured population relies more on visual cues for balance than a normal uninjured population. Somatosensory inputs consists of touch and proprioception. Input from these two sensory sources provides critical feedback to the CNS regarding position in 3-D space, body sway and to changes in terrain. The sensory input from touch and proprioception allows the muscles to make constant, automatic adjustments to maintain balance and avoid falls. Ironically as I write this essay a bird has crashed head long into my patio door a few feet away. The bird lays concussed stunned lying on its side on one of our summer patio chairs. The bird is very still not moving. I run to my office retrieving my camera, I start snapping picture through the screen door. His eyes start to move in his head then abruptly he jumps onto his legs looking around no doubt trying to reconnect with what has just happened. He leaps into the air taking flight for a few feet he still seems lost walking around now at the edge of the concrete balcony. The bird still is not flying higher than our fence at the edge of the property. The bird finds a gap in the fence slipping away into the neighbour’s property. The bird’s concussion is a sign. MR-image courtesy of R. Goebel and N. K. Logothetis, rendered with BrainVoyager software. So as you can observe the understanding of visual input is at its infancy in terms of interpretation. 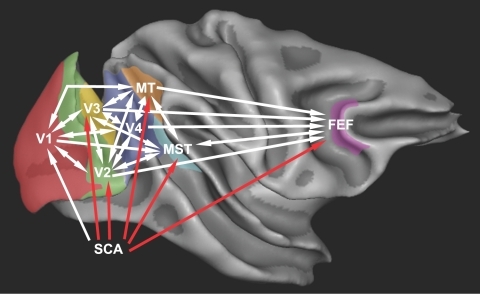 The absolute pathways are cited from August 2008 Issue of PLoS Computational Biology Combining Structural Connectivity and Response Latencies to Model the Structure of the Visual System Michael Capalbo, Eric Postma, Rainer Goebel Department of Cognitive Neuroscience, University of Maastricht, Maastricht, The Netherlands, MICC/Department of Computer Science, University of Maastricht, Maastricht, The Netherlands. Visual connectivities are being only now just worked out in terms of signaling traffic optimized into the structurally shortest routes. 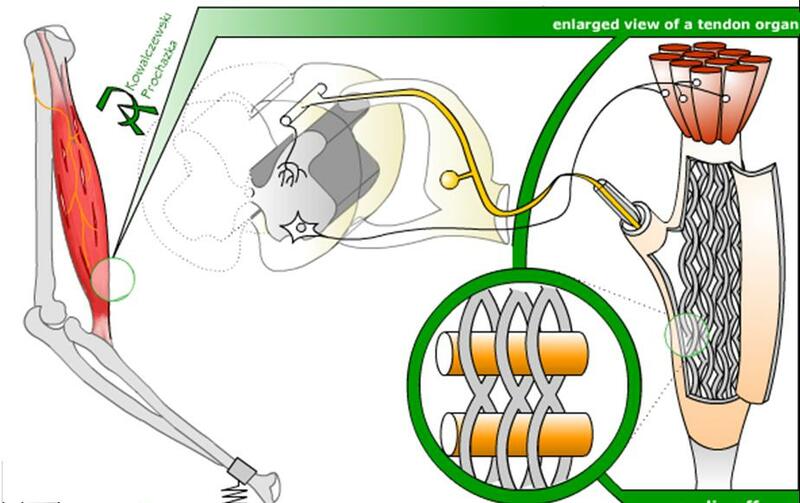 The above image is a mere taste of explanation as a case analysis of optimizing where visual information flows, let alone how the vestibular system meshlinks into the connectivity. Some final thoughts on what may appear as a disjointed messy essay on a concussed bird, visual structural connectivity and vestibular input deranged following a concussion. The sign of the concussed bird is: the bird lay very still for a long time. It looked as if one of the legs may have been fractured the small talons were visible abnormally underneath the feather torso as I peered through my view finder. The first signs were in the eyes, they started to move before the head did. Then the head moved then the body moved. So here is my observation. As a concussion happens the eyes are actively affected first as the recovery sequence toward interaction with the environment evolves. The eyes are out of sync with the orientation of where the head is, this happens within the eye muscles demeshed no longer smoothly coordinating the vestibular position of the eyes moving. It doesn’t take a sophisticated balance platform to determine the demeshed eye positioning post concussion defects, it can take a video game like the NCAA approved Nintendo WiiFit to test for the eye balance concussion disorder. That’s what I think can be done as a reliable insight to measure the sign from the concussed bird that happened outside my window, yesterday. Diagnosis can be brought into the skill set of a video game which opens the door to detection for anyone who has access to the balance game platform.